Willoughby, Malcolm F., Yankton - Yacht and Man-of-War, Crimson Printing Company, Cambridge, Massachusetts, 1935. USS Yankton, a converted yacht (formerly the civilian yacht "Penelope"), served in WWI in tours of duty that intersected with subchasers in a couple of places. The most relevant tour of duty to the study of subchasers was USS Yankton's service as flagship of the American naval presence at Archangel, Russia, and then as tender once USS Des Moines arrived and took over the role of flagship. Three subchasers participated in the Northern Russia Expedition, SC 354, SC 95 and SC 256. After making the voyage up the coast of Norway, the unit of chasers was met by USS Yankton in the vicinity of Murmansk, and was led into the White Sea to the port at Archangel, Russia. 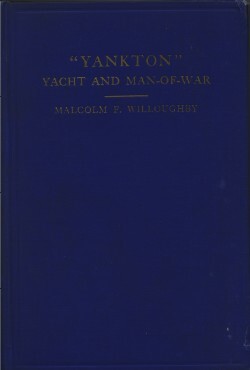 Willoughby's book provides a detailed account of USS Yankton's work in the war. It is so detailed, in fact, that unless this vessel is of particular interest to you, you probably won't feel inclined to read it cover-to-cover. It is not a dramatized story of submarine hunts or daring exploits, but rather an exhaustive, chronological walk through the vessel's role in the war, presented in a "just the facts" style. Chasers are mentioned a few times in the book, but never in any depth. There is a quick account of meeting up with a fleet of seven chasers off the coast of Maine, a pleasant but uneventful encounter; an account of being sent to meet the unit of chasers at Murmansk in 1919; and a mention of USS Yankton and the three chasers being the last of the group to leave Archangel following the Fourth of July festivities. For those interested in USS Yankton in particular, there are good photos, including many shots of the ship, crew, and officers. For those interested in the chasers, the account of conditions in northern Russia in 1919 is quite good. Available online at used book sellers for $40 to $50.